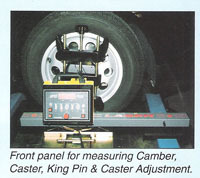 Each measuring unit has a complete microprocessor based system using two high precision electronic sensors measuring Camber, Caster and King Pin. The angles are displayed in degrees and minutes. The resolution is factory set to 1 min., but can also be set to 5 min, in either 1/60 or 1/100 degrees. An Electronic Run Out Compensation System compensates on all four wheels using easy push button recording. The push buttons record and store the values for instant recall during the alignment check procedure. Caster adjustment is performed on the measured Caster value, so the true Caster value is available when performing adjustment. 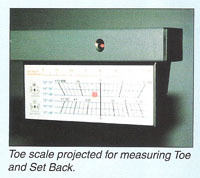 Each measuring head projects two clearly visible laser beams giving Single/Total Toe and Set Back. 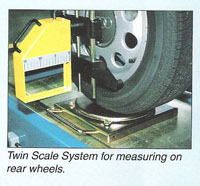 With the additional Retro Mirror Kit, Single and Total Rear Toe and Thrust Line are measured simply and quickly.